Students traveling from a Philadelphia school to Washington DC on a field trip were injured when their charter bus overturned on I-95 in Maryland this morning. 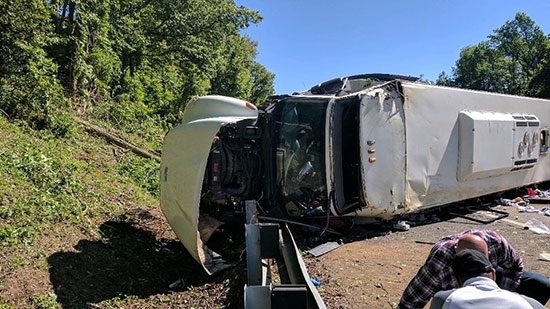 26 eighth-grade students, two staff members, one parent chaperone and the driver were on board when the bus flipped over in the Havre de Grace area around 9:25 a.m. The students were from the Charles W. Henry School in Mount Airy. One child and one adult were airlifted, the others were transported by ambulance to area hospitals. Maryland State Police say that a driver of a car lost control while trying to pass the bus and clipped the front of the bus. Another bus carrying Philadelphia police personnel heading to Police Week in DC happened to be in the area and stopped to help with the scene. Officials confirm that the body of a man that washed up on the shore of the Delaware River in Salem County, NJ last night is that of a boater who went missing Sunday afternoon. 38-year-old Frank Montana Jr. and his cousin Chris Montana went out in a 12-foot boat to check on crab traps in the Penns Grove area. Neither man was wearing a life vest. At around 2 p.m., the boat capsized in rough conditions. Chris was able to swim to shore and was treated for hypothermia, but Frank went missing. A Coast Guard helicopter, rescue boats, and divers searched for hours before calling off the search. The body was discovered around 10 p.m.
Police in Upper Dublin, Montgomery County, are investigating after flyers supporting the Ku Klux Klan were found left in residents' driveways in the Maple Glen section. The flyers are similar to ones found in Cinnaminson, NJ, on February 12th. Police believe they were distributed at random early Monday morning. Police said in a statement, "These acts of hate will not be tolerated in Upper Dublin and anyone who may have observed suspicious person(s) and/or suspicious vehicle(s) in the Maple Glen area during that time frame is encouraged to contact our Department at 215-646-2101."